Volcano is a census-designated place (CDP) in Hawaii County, Hawaii, United States located in the District of Puna with a small portion of the CDP in the District of Kaʻū. The population was 2,575 at the 2010 census, up from 2,231 at the 2000 census. Volcano is located on the east side of the island of Hawaiʻi at 19°26′59″N 155°14′8″W﻿ / ﻿19.44972°N 155.23556°W﻿ / 19.44972; -155.23556 (19.449831, -155.235493), on the border of Hawaii Volcanoes National Park and near the northeast rim of Kīlauea's summit caldera. According to the United States Census Bureau, the CDP has a total area of 58.6 square miles (151.7 km2), all of it land. 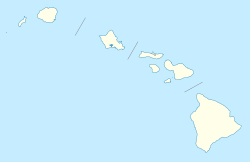 Hawaii Route 11 passes through the southern part of the community, leading northeast 27 miles (43 km) to Hilo and southwest 37 miles (60 km) to Nāʻālehu. Owing to its altitude, ranging from below 2,800 feet (850 m) in the southeast to over 6,200 feet (1,900 m) at its uninhabited northern end, Volcano features a subtropical highland climate (Köppen Cfb), with relatively uniform temperatures and abundant rainfall throughout the year, although rainfall is concentrated during the months of November through April. The hardiness zone is 11a. As of the census of 2010, there were 2,575 people in 1,228 households residing in the CDP. The population density was 45.4 people per square mile (17.5/km²). There were 1,740 housing units at an average density of 30.7 per square mile (11.9/km²). The racial makeup of the CDP was 51.53% White, 0.74% African American, 0.39% American Indian & Alaska Native, 11.57% Asian, 9.79% Native Hawaiian & Pacific Islander, 0.43% from other races, and 25.55% from two or more races. Hispanic or Latino of any race were 8.82% of the population. There were 1,228 households out of which 17.6% had children under the age of 18 living with them. The average household size was 2.10. In the Volcano CDP the population was spread out with 17.3% under the age of 18, 5.4% from 18 to 24, 8.8% from 25 to 34, 16.4% from 35 to 49, 34.6% from 50 to 64, and 17.5% who were 65 years of age or older. For every 100 females, there were 99.3 males. For every 100 males there were 100.7 females. The median income for a household in the CDP at the 2000 census was $35,977, and the median income for a family in 2000 was $44,432. Males had a median income of $30,929 in 2000 versus $31,679 for females. The per capita income for the CDP in 2000 was $18,913. About 10.4% of families and 14.3% of the population were below the poverty line in 2000, including 15.0% of those under age 18 and 2.3% of those age 65 or over. As of the census of 2000, there were 2,231 people, 896 households, and 498 families residing in the CDP. The population density was 39.4 people per square mile (15.2/km²). There were 1,229 housing units at an average density of 21.7 per square mile (8.4/km²). The racial makeup of the CDP was 47.87% White, 0.49% African American, 0.54% Native American, 11.39% Asian, 12.24% Pacific Islander, 1.34% from other races, and 26.13% from two or more races. Hispanic or Latino of any race were 9.28% of the population. There were 896 households out of which 24.6% had children under the age of 18 living with them, 41.4% were married couples living together, 9.5% had a female householder with no husband present, and 44.4% were non-families. 34.7% of all households were made up of individuals and 7.5% had someone living alone who was 65 years of age or older. The average household size was 2.25 and the average family size was 2.92. In the CDP the population was spread out with 20.3% under the age of 18, 6.7% from 18 to 24, 30.7% from 25 to 44, 30.3% from 45 to 64, and 11.9% who were 65 years of age or older. The median age was 41 years. For every 100 females, there were 116.2 males. For every 100 females age 18 and over, there were 125.2 males. The median income for a household in the CDP was $35,977, and the median income for a family was $44,432. Males had a median income of $30,929 versus $31,679 for females. The per capita income for the CDP was $18,913. About 10.4% of families and 14.3% of the population were below the poverty line, including 15.0% of those under age 18 and 2.3% of those age 65 or over. Boone Morrison (1941-2018) Born in California, he was a long time resident of Volcano and known by most. He was a freelance residential and historical architect for the Big Island of Hawai’i, a premier photographer and was the first to photograph Hawai’i's Merrie Monarch Festive of Hula. He was well known model railroad enthusiast and a previous writer for Narrow Gauge & Shortline Gazzette. His articles were short and sweet with an emphasis on photographs of his amazing models and scenes. Gordon Morse (b. 1927) Gordon Morse was born in Hawaii. From 1950 - 1968 he was the Photo-Journalist of The Honolulu Advertiser on Oahu. Covering news articles including, Astronaut Training in the Pacific prior to the first moon landing, All Volcano Eruptions from 1955 to the present, First submarine missile launch in the Pacific, and many others. In 1968 he retired from the everyday newspaper writing and started the first RV Camper Rental Company in the State of Hawaii. Extending this service to supplying housing, food service, and transportation to remote locations across the Hawaii Island including the Mauna Kea Observatory development sites. Upon retirement in 1985 Gordon and his wife Joanne opened their estate at Volcano, Hawaii - just outside the Volcanoes National Park - into a Bed & Breakfast Inn. This allowed Gordon to spend more time to revert to his love of writing. He has 14 written books in paper form for sale at this time. ^ "Geographic Identifiers: 2010 Demographic Profile Data (G001): Volcano CDP, Hawaii". American Factfinder. U.S. Census Bureau. Retrieved June 7, 2017. ^ "Monthly Averages for Volcano, HI". Weatherbase. Retrieved 2013-04-22. This page was last edited on 6 April 2019, at 01:10 (UTC).